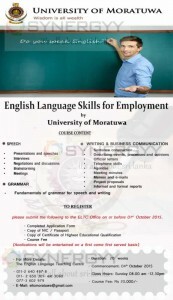 University Of Moratuwa invites applications for the English Language Skills for Employment, this programme content of Speech, Grammar and Writing & Business Communication. The programme is schedule for 20 weeks commences from 4th October 2015 from 8.00 Am to 12.30 Pm. Please submit the following to the ELTC Office on or before 01st October 2015.